Please see here the press note from Church of South India (CSI) condemning the attacks on Churches in India and demanding action. The recent vandalism and attacks on five Churches in different directions of the city of New Delhi has evoked a strong sense of insecurity and anguish among the Christian community in India. This is an alarming atmosphere apparently linked to the Ghar Wapsy Programme organized by some religious fanatics. There is a strong feeling that the Central Government is not doing enough to reassure the minority communities in the country in spite of the continued orchestrated and systematic attack and vandalism on Churches which included miscreants, breaking open the Churches and desecrating hol y objects and also setting a church on fire. The Church at large in India demands that the Government should initiate a judicial enquiry and also take steps to ensure repair and restoration of the damaged churches. The Prime Minister is still silent on the issue. With the backdrop of these attacks, he should have come forward and issued a statement installing confidence and security amongst the peace loving Christian community in the country. The church is a minority community in the country but the contribution and impact it made on the country's development has been immense and unparalleled particularly in the fields of education and health. The Church in South India urges the Central government to create a sense of security, safety and a new hope for the minority communities not just the Christian minority community but all the minority communities at large. 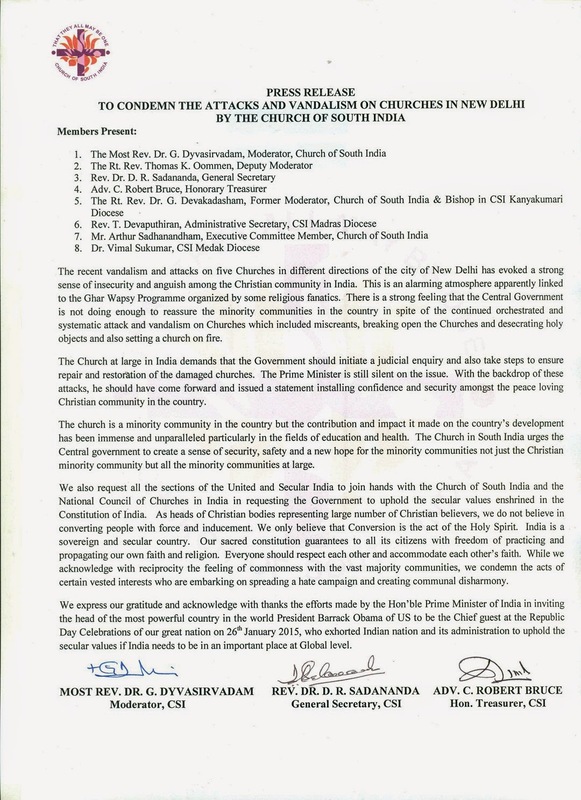 We also request all the sections of the United and Secular India to join hands with the Church of South India and the National Council of Churches in India in requesting the Government to uphold the secular values enshrined in the Constitution of India. As heads of Christian bodies representing large number of Christian believers, we do not believe in converting people with force and inducement. We only believe that Conversion is the act of the Holy Spirit. India is a sovereign and secular country. Our sacred constitution guarantees to all its citizens with freedom of practicing and propagating our own faith and religion. Everyone should respect each other and accommodate each other's faith. While we acknowledge with reciprocity the feeling of commonness with the vast majority communities, we condemn the acts of certain vested interests who are embarking on spreading a hate campaign and creating communal disharmony. We express our gratitude and acknowledge with thanks the efforts made by the Hon'ble Prime Minister of lndia in inviting the head of the most powerful country in the world President Barrack Obama of US to be the Chief guest at the Republic Day Celebrations of our great nation on 26th January 2015, who exhorted Indian nation and its administration to uphold the secular values if lndia needs to be in an important place at Global level.